*Turn a gourd into a birdhouse, *surprise mom with a baby day lily, *pick your own veggies, *pony rides *photos, and *great food. There will be horseshoes to pitch and washers to throw. FREE farm tours including baby chicks, ducks, goats, chickens, emus, rheas and Bojangles the ostrich. There will plenty to see and do for kids of all ages. 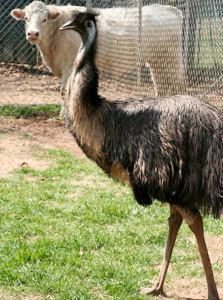 Tell your friends you went to see the emu! After the festival, enjoy a relaxing day shopping in beautiful downtown Bowman. This little town has a lot to offer with 6 antique shops, a thrift store, a consignment store, barber, auction house, grocery, and more. With so much to do and see, we're sure you'll be coming to visit us again soon. *There may be a small fee for this item or activity.